Coming from a long line of noblemen, Jakben turned to thievery for unknown reasons. He became known as Springheel Jak, so called because of a unique pair of enchanted boots which gave him great leaping ability. He was a partner of Emer Dareloth, although when Dareloth was cursed by Nocturnal for stealing the Gray Cowl, Jakben's memories of him were erased. Without his partner, Jakben attempted to single-handedly rob the crypt of Taren, and was infected with vampirism. He became a member of the Cyrodiil Vampyrum Order, but for nearly a century Jakben could not control his bloodlust. Eventually he gained some measure of control, and abandoned his life as a thief to return to the life of a nobleman, a guise used by many Cyrodilic vampires. Jakben lived as a nobleman in the Imperial City for two hundred years. He owned a large manor in the Talos Plaza district; beneath the manor lay the family crypt, which Jakben turned into a vampire lair. He played the part of a reclusive and private gentleman, who suffered from a "rare skin condition" which disallowed him to go out during the day. At night, he fed on the people of the Imperial City. Gemellus Axius served as Jakben's manservant, and was the only mortal to know of his secret. In 3E 433, Count Corvus Umbranox, a successor of Dareloth who had inherited the Cowl's curse and, as such, was known only as the Gray Fox, learned of the existence of the Boots of Springheel Jak. 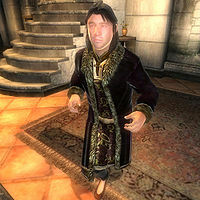 Umbranox required these boots for a planned robbery of the Imperial Palace, and sent an accomplice to steal them from Jakben, thinking him to be a descendant of the master thief. When confronted, Jakben gave the thief access to the crypt beneath the house. The thief found Jak's coffin empty, and Jakben revealed his true identity before attempting to kill the intruder. Jakben and the other vampires were defeated, and the boots brought to Umbranox. The Imperial Watch later discovered the earl's body and the den of vampires. Jakben's corpse burned in the sun, and the populace of the Imperial City were shocked to discover his vampiric nature. The boots were later destroyed during the successful robbery coordinated by Umbranox. Esta página foi modificada pela última vez à(s) 14h58min de 2 de julho de 2014.